England is first mentioned indirectly at Blázinec where the inmates could pretend to be King of England without any repercussions. Later England appears through the propaganda expression Gott strafe England. Still there is very little connection with England in the novel - amongst the few references are London, Grey, Shrapnel, Dalton, Darwin, Yorkshire (pig) and the magazine Country Life. England was in 1914 centre of the British Empire, the largest colonial power the world has ever seen. The empire entered the war on 4 August, through the alliance with France and Russia (The Entente), provoked by the German attack on Belgium. 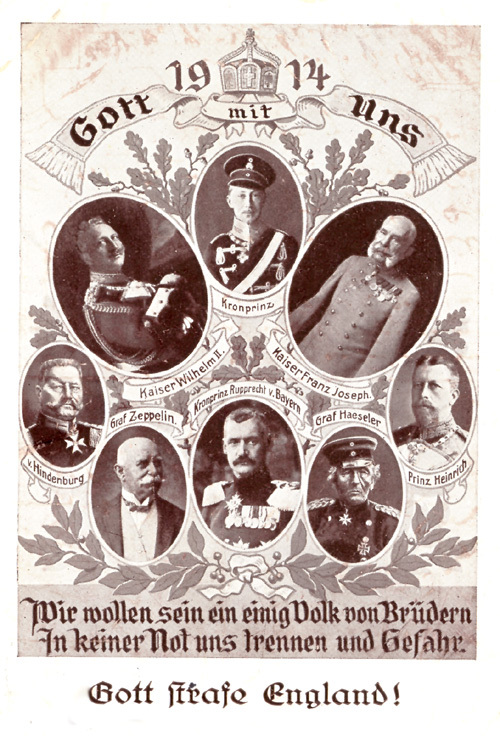 The declaration of war on Austria-Hungary followed on 12 August. There was little of fighting between British and Austro-Hungarian forces as the former mostly fought on the Western Front, in the Middle East, in the colonies and on the seas. By the end of 1914 allmost all the German colonies had been conqured. The British Empire's economic power and its control of the seas were crucial to the outcome of the war. Particularly effective was the naval blockade of the Central Powers. Krkonoše is mentioned when it is revealed that a professor at Blázinec claimed that the cradle of the gypsys was in these very mountains. Krkonoše is a mountain range on the border between Poland and the Czech Republic, in 1914 the border between Austria-Hungary and Germany. The name is very old, was mentioned by Ptolemaios, and may be of indo-european origin. The interpretation of the name has been preserved, and the latin name was Gigantei montes. These are the highest mountains in the Czech Republic, Sněžka reaches 1602 metres. [1.4] Taky jsem se tam sešel s několika profesory. Jeden s nich pořád chodil za mnou a vykládal, že kolíbka cikánů byla v Krkonoších, a ten druhý mně vysvětloval, že uvnitř zeměkoule je ještě jedna mnohem větší než ta vrchní. Jaroměř is mentioned when Švejk, during his interrogation, list the songs he knows. Immediately after he is thrown out of Blázinec. Jaroměř is an old town near Hradec Králové in eastern Bohemia. Today (2017) the town has around 12,000 inhabitants. In 1913 Jaroměř was part of hejtmanství Dvůr Králové nad Labem. The population in the town itself counted 7,859 and almost all of them were registered with Czech nationality. 181 were listed as military personnel, no doubt due to the proximity to the garrison town Josefov. Jaroměř was located within the Lokres of the same name and also hosted a parish and a post office. Salmovská towards Ječná, marking the site of the former police station. 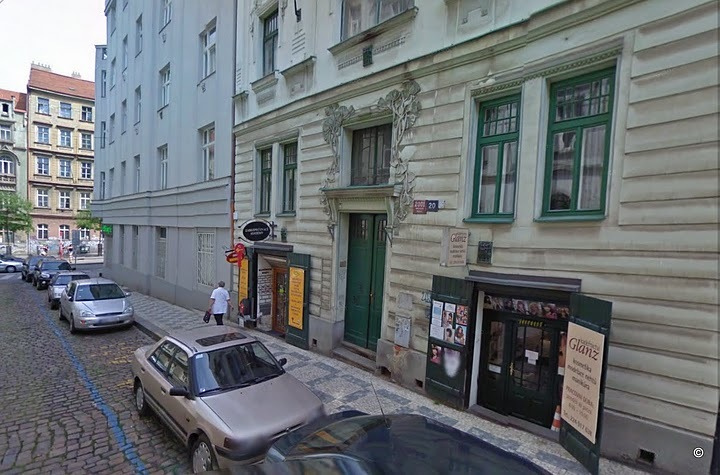 Salmova ulice is first mentioned at the end of [I.4] when Švejk was sent to the police station in this street after being thrown out of the madhouse. Here he encounters the brutal inspector Braun and shares the cell with a good citizen who has ended on a slippery slope after a company party. The date of his stay must be just after 28 June 1914 because Švejk reads the declaration of war as he is escorted onwards to Policejní ředitelství. Nearly all of [I.5] takes place at this police station. Salmova ulice is the author's way of writing Salmovská ulice, a short and curved street in Nové Město, not far from U kalicha. At the time there was a police station at the corner of Ječná ulice (see Policejní komisařství Salmova ulice). The street is named after Franz Altgraf von Salm-Reifferscheid who at the end of the 18th century laid out a large garden behind house No. 506. Why the author used the name Salmova ulice is not clear. The name of the street was changed from Salmova til Salmovská already in 1870 but newspaper adverts show that Salmova was in use well into the interwar years. Thus the name was used side-by-side with the official Salmovská, so the use of Salmova is surely the author's choice (and not a typing mistake). Interesting enough an advert from 1891 was placed by a certain Josef Švejk who lived in No. 14. He put beech planks up for sale. [1.4] Švejk prohlásil, že když někoho vyhazují s blázince, že ho nesmějí vyhodit bez oběda. Výtržnosti učinil konec vrátným přivolaný policejní strážník, který Švejka předvedl na policejní komisařství do Salmovy ulice.